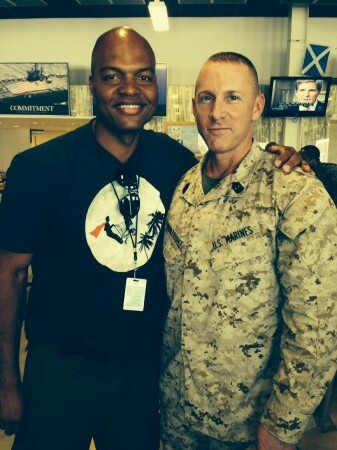 When I was asked by my friend, Dré Bly, if I wanted to represent the NFL on a mission to Djibouti, Africa, to visit our troops, I didn’t even have to think. The answer was YES. And so began the voyage. It required preparation. Updated immunizations and anti-malaria medicine for starters. And then the mental adjustment of what you’re about to experience. We knew we’d be staying at the American base in Djibouti, living like the soldiers. Cots for beds, rusty showers, 100 degree temperatures and dirt. Lots of it. Were we up for it? We traveled for 18 hours before arriving at our destination. What is immediately striking is the lack of infrastructure and security that is commonplace in the US. Paved roads, clean water, and police are all hard to find here. The poverty of the region spills onto the streets as residents, young and old, panhandle on every corner, accepting any food or beverage you offer. Traveling to the base, you’re aware that you’re in a place that might not be safe. But you don’t feel threatened, just very alert. The base is huge, a city within a city, strategically located on the ocean at the Horn of Africa, bordering Ethopia and Somalia. It houses four to five thousand of our best and brightest troops. Because of the lack of immediate danger close by, they often find themselves simulating missions and rescues along with biding time, waiting for their next deployment. The area is important to U.S. national security, post 9-11. Moreover, it’s important to the world economy — 10 percent of all goods shipped in the world pass through Djibouti’s port. During our stay, we met with the troops one on one and in groups. We wore our jerseys, signed autographs, and spread good cheer. It’s important to be positive and uplifting, which was easy when you see the troops – people who are sacrificing their lives for our well being. While we lived on base (and yes, it was everything we were told), we did get to go for a swim in the ocean one afternoon in some of the most beautifully clear water you can imagine. Porpoises danced around us and our boat. It was magic. We also got back to reality pretty quickly when we came back to shore. Here are some of my takeaways from the trip. I left Djibouti humbled and filled with more compassion for others. I am all the more grateful for my life in the U.S. Here we have riches beyond most people’s dreams. I also left with appreciation for our troops. What a solid group of people. They really care and are selfless. And finally, I walked away with a better understanding of diplomacy, our involvement in this region, and our role in the world. This was an experience that opened my eyes. And my heart.